Integrated Flood Management (IFM) is a new approach to flood management which is based on the concept of Integrated Water Resources Management (IWRM). IWRM is a process which promotes the co-ordinated management and development of water, land and related resources, in order to maximise the resultant economic and social welfare in an equitable manner without compromising the sustainability of vital ecosystems. While traditional flood management has focused on defensive practices (flood control and protection by structural measures, e.g. dikes) only, integrated flood management is a proactive management of risks due to flooding. Being a holistic approach, IFM emphasizes the links between flood management and socio-economic development as well as the protection of natural ecosystems. Integrated flood managment joins the sum of all operational activities to be taken before, during and after an event as well as political and administration decisions that are aimed at preventing or mitigating a flood event or even a flood disaster. In the later sense flood management is similar to flood risk management, which includes all measures and methods applied to achieve the required safety especially against catastrophes thus design events with return periods much more larger than 10 or 20 years. Integrated risk management is an approach to risk management that embraces all soures, pathways and receptors of risk and considers combination of structural and non-structural solutions. 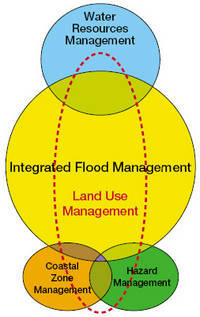 The flood managment, which deals with a concrete event of flood is called Flood event management.